Companies are sorted alphabetically by default. You can also sort your companies by the date they were added to your CRM or by the last activity date for that account. To change how your company listings are sorted, click on the Name dropdown and select your sort option. Filters enable you to view specific listings based on your selections. There are several filter options available: letter, tags, status, and websites, if applicable. For example, to view all companies within your CRM whose company name begins with the letter "L", click on the "L" from the available letters. Only Companies with that begin with the letter "L" will be displayed. 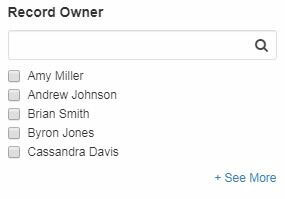 You can also filter your companies using tags that you've created or selecting a status. The All status includes companies have either an active or inactive status. If you are an ESP Websites subscriber, customer accounts that are created via an ESP Website or Company Store will be added to your CRM. 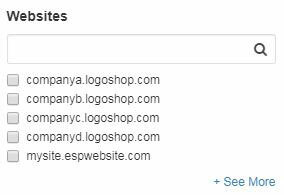 You can click on a domain name under websites to view all customer accounts created through the ESP Website or Company Store you selected. 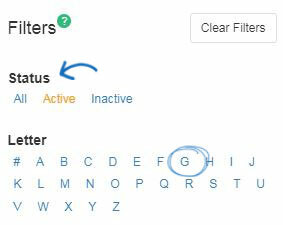 To reset the filters, click on the Clear Filters button. This will display all companies.